Go raid the State Department on C Street Now! A couple of items caught my attention recently in HuffPo on the subject of illegal immigration. First, John McCain on tee-vee talked about illegal immigrants “intentionally causing accidents on the freeway.” See the video here: http://www.youtube.com/watch?v=yDPuNA7L0QU. I scratched my head when I watched that; and I tell you — I’m still scratching. As best I could tell, this is only possible if undocumented aliens managed to get the Harry Potter cloak, get to the freeway without being seen, walk on the white lines, wait for the All-American drivers driving their foreign made cars, then jumped on them thereby causing these weird intentional accidents. Of course, because they are in cahoots with ambulance chasers, these undocumented aliens can very quickly take you to court, or Judge Judy, or take you to the cleaners, or chop you up and put you in a salted jar. Trying to imagine how the McCain scenario is possible is hard enough for my poor brain. Not too long after that, Rep. Brian Bilbray (R-Calif.) gave me an even braindead headache. He also went on tee-vee and said that “trained professionals” can identify undocumented workers just by looking at their clothes. From HuffPo: Discussing Arizona’s pending profiling bill on “Hardball,” Chris Matthews challenged Bilbray to cite a “non-ethnic aspect” by which law enforcement agents could identify illegal immigrants. “They will look at the kind of dress you wear, there is different type of attire, there is different type of — right down to the shoes, right down to the clothes,” Bilbray replied. See one of our smarties on the Hill talking about it here: http://www.youtube.com/watch?v=e-BlskNRJ7c. Folks — we are now in ultra dangerous territory. See, based simply on Bilbray Says on clothes and shoes, law enforcement agents possibly could raid the State Department in Foggy Bottom or FSI. Frankly, I think they would net quite a few “illegals” especially those who are used to wearing strange shoes and un-American clothes overseas. The hats and bags will come later, and if you happen to speak a foreign language, gods help you. I’m not even sure where we would go to bail you out, you foreign, you! jointly by the U.S. Dept. 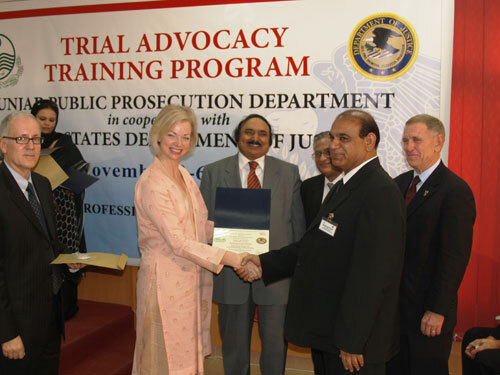 of Justice and the Punjab Public Prosecution Dept. Congressman Bilbray, please meet Carmela Conroy, our US Consul General in Lahore and a fashionista. A lovely lady; here she is in teal. You can view CG Conroy in a television interview here . She speaks with no accent, by the way. She might be a Kiwi, she once lived in New Zealand; or maybe Japanese or Afghani, who knows? She lived all over the place. There is also this quite popular guy (see below), who used to walk the same halls you roam now. Please meet one of our favorite media-savvy ambassadors, Tim Roemer. 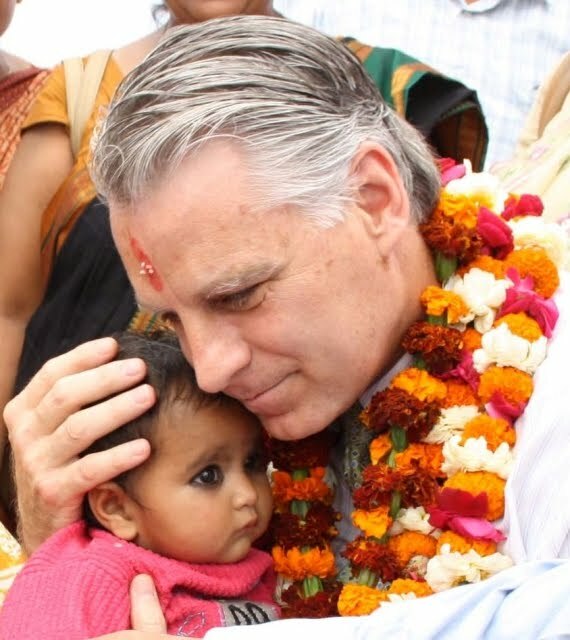 No, no, that’s just a lei, something they put around your neck in appreciation — Tim Roemer is not/not a foreigner. Write that down. of mothers and children, March 17, 2010. I gotta run now but I should take this opportunity to warn the Cyberbones couple (Shannon and her FSO). 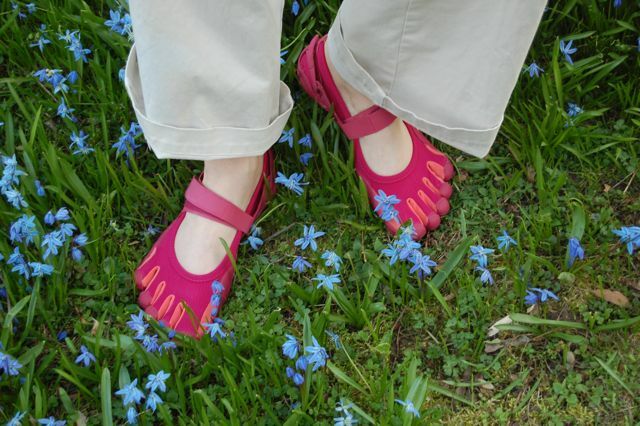 Please, please do not/not wear these shoes if you visit the USofA this summer. Warn the husband, too. See — these strange shoes can possibly get these American diplomatic couple jailed or deported, if Congressman Brian Bilbray get his “trained professionals” to look over their feet. These are ALIEN shoes! Ruuuuuunnnnnn! Oops, sorry, got carried away. Arrest them, nooooow!!! Oops, I think I really need a drink. I am truly grateful I do not live in John’s Arizona or Brian’s congressional district or I’d be walking all week with a paper bag on my head in my Japanese kimono.